The magnificent building that is the Round Chapel we see today opened in 1871, but its beginnings were more modest than what you see. The story of the Round Chapel begins with a nonconformist, congregationalist church established in 1804 at the Old Gravel Pit Chapel on nearby Morning Lane. The Gravel Pit Chapel was in turn a breakaway group from the Ram's Chapel in Homerton. Such groupings and regroupings were common in Hackney from the 17th Century onwards as East London became an important centre of the nonconformist movement – in other words, churches that would not conform to the rules of the established Church of England. There were two nonconformist burial grounds, at Bunhill Fields and Abney Park Cemetery, and three Dissenting Academies (independentand non-conformist education institutions) – Homerton, Newington Green and Hoxton – which produced nonconformist figures including the author of Robinson Crusoe, Daniel Defoe, and the renowned hymn writer Isaac Watts. In the 19th Century the population of Hackney was expanding fast. Between 1841 and 1871, the borough’s population increased from 38,000 to 115,000, and then doubled again over the following thirty years. Clapton, in particular, grew rapidly and experienced intensive house building in the 1870s and '80s, creating a new, leafy suburb called the Clapton Park Estate. By1868, the congregation at the Old Gravel Pit had quadrupled,and they decided to build a new, much bigger chapel as part of the new development nearby in Clapton to take account of the increasing popularity of the area. The Clapton Park Chapel, known as the Round Chapel, would become one of the important nonconformist centres in East London. But despite its members and missionary activities increasing in the 1870s and 1880s, from the turn of the century the congregation shrunk as the composition of the neighbourhood changed and the slow but steady exodus to London’s outer suburbs began. The architectural importance of the Round Chapel has been recognised and protected through its status as Grade II* on the National Heritage List for England, meaning that it is in the top four percent of protected buildings in the country. The designation made specific mention of the chapel’s interior for its unique shape, and for the cast iron columns, which caused controversy at the time of building as they were typically only used in music halls and railway stations. In 1991, Hackney Historic Buildings Trust agreed with the Clapton Park URC that HHBT would take over the main auditorium and ancillary rooms, while the adjoining Old School Rooms would be kept by the church. The Trust then worked with English Heritage, the Association of Building Preservation Trusts and Hackney Council to raise almost £1 million to repair and conserve the auditorium. This refurbishment received a Civic Trust Award in 1998. 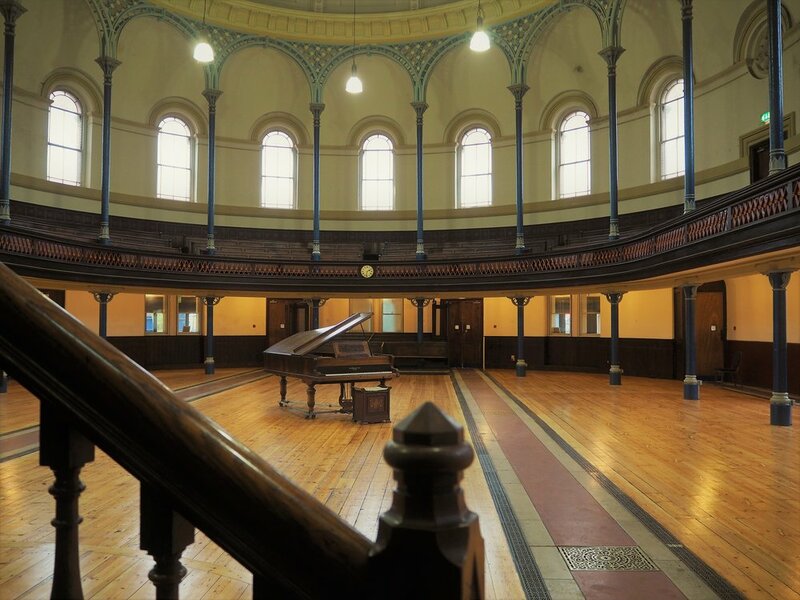 HHBT owns and manages the Round Chapel as an arts and community venue, and manages St. Augustine's Tower in nearby St. John's Churchyard which it runs as an educational resource, by agreement with the owner Hackney Council.